Coastguards of Yesteryear - Articles: Another Coastguard V.C. Articles Home » Medals » Another Coastguard V.C. MEDAL WON: INDIAN MUTINY, 13 MARCH 1858. BORN: PORTSEA, 17 JUNE 1838. DIED: WINDSOR CASTLE ESTATE, 2 OCTOBER 1896. MEDAL: NATIONAL MARITIME MUSEUM, GREENWICH. On 13 March 1858 at Lucknow, India, some sandbags on top of the earthworks were on fire. The enemy were only 50 yards away at this time, but Able Seaman Robinson, under heavy fire, jumped up and extinguished the fires in some of the bags and threw others clear. He was severely wounded. There seems to be some confusion as to the whereabouts of the medal, it is reported to be at the National Maritime Museum, Greenwich and also at the National Army Museum at Chelsea. A unique ceremony took place on Monday, 15th May 2000, when HRH The Duke of Edinburgh unveiled a reconditioned headstone to local hero Able Seaman Edward Robinson VC, Royal Navy, at Old Windsor Cemetery. It had come to the notice of the Dedworth & Old Windsor and Windsor branch of The Royal British Legion that Robinson's headstone in the cemetery had deteriorated badly and the inscription was almost unreadable. The Legion branch decided to channel their efforts into refurbishing the grave of Edward Robinson and the Branch Memorial Sub-Committee, under the guidance of George Murray, set about to raise the necessary funds. The culmination of their efforts resulted in the ceremony held on the 15th May 2000. The programme consisted of the arrival of HRH The Prince Philip, Duke of Ediburgh KG KT, who was invited to the Chapel to meet the relatives of Edward Robinson's and sign the visitor's book. After which he was escorted to the grave plot by George Murray where, after a short message of greetings and thanks, Prince Philip unveiled the reconditioned headstone. Following the ceremony, HRH Prince Philip, and guests, were invited to take refreshments and view the VC exhibits in the Old Chapel, by kind permission of Old Windsor Parish Council. HRH THE DUKE OF EDINBURGH KG KT, HAS UNVEILED A REFURBISHED HEADSTONE TO ABLE SEAMAN EDWARD ROBINSON VC IN OLD WINDSOR CEMETERY. [ London Gazette, 24 December 1858 ]. Lucknow, India, 13 March 1858, Able Seaman Edward Robinson, Royal Navy ( Naval Brigade ). "For conspicuous gallantry shown on 13th March 1858 in having at Lucknow, under heavy musketry fire within 50 yards, he leapt on top of the burning earthworks to extinguish burning sandbags. He managed to put out some and the rest he threw clear, before being seriously wounded in the shoulder and being dragged back to shelter by his gun crew." 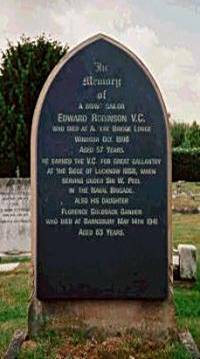 Edward Robinson was invested with his Victoria Cross by Queen Victoria at Windsor Castle on the 4th January 1860. Edward Robinson was invalided from the Royal Navy later in 1858 and was employed as a Coastguard for 10 years followed by 10 years in the Naval Reserve Office. Through the friendly interest of the then Duke of Edinburgh ( son of Queen Victoria ) who kept closely in touch with the Nation's heroes at his mother's request, Edward Robinson was employed as a gardener at Windsor Castle. When this became difficult for him, he was appointed Gatekeeper at the Old Windsor entrance to the Home Park, a position normally held for soldiers and sailors of good character. He lived in Albert Bridge Lodge with his family and died there on 15th March 1896. "Relief of Lucknow" - "Lucknow"